Unlike wood-based models, the Heat 1X is a real metal rocket. At more than 9 meters high, it's also the largest amateur rocket in the world. The guys building it are planning one almost as large as the V-2. They call themselves Copenhagen Suborbitals, and they operate from an abandoned shipyard in the outskirts of the Danish capital. This group of nutters rolled out their Heat 1X engine last Sunday. 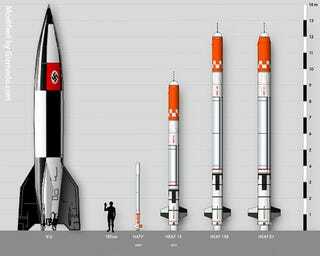 The image above puts it next to their planned beasts and the first ballistic missile ever: The German V-2.